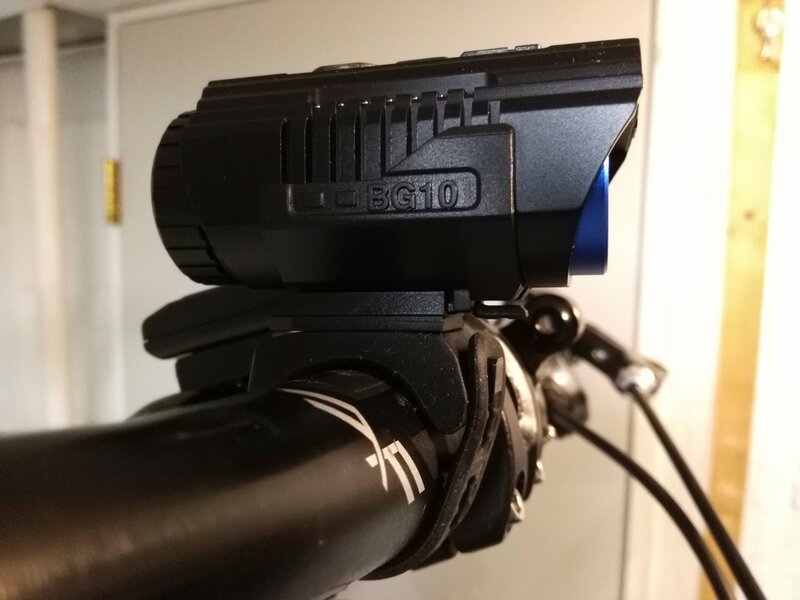 Banggood graciously agreed to send me this Imalent BG10 bike light free in exchange for a review. As always, I give my honest opinions and state the facts from my tests. 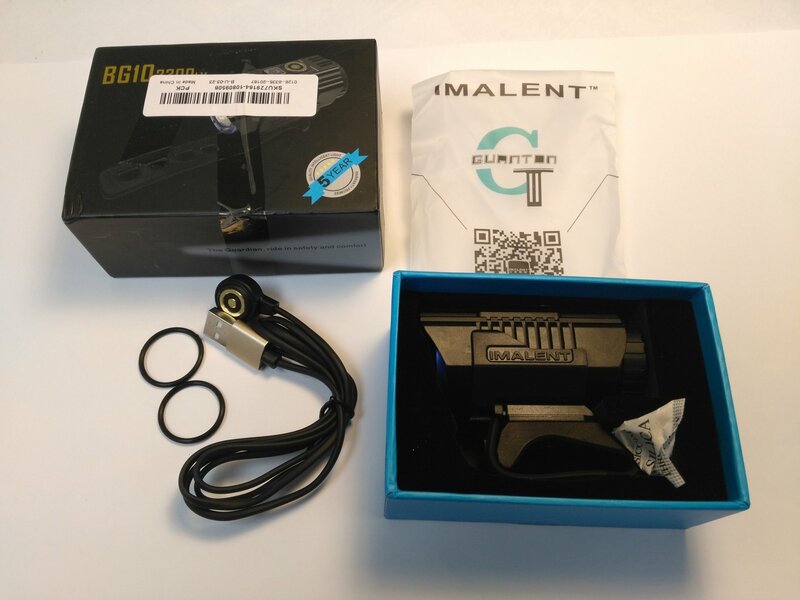 Banggood shipped this pack out “standard shipping”, which used China EMS (Express Mail Service), on January 31st and it was delivered to me on February 12th. 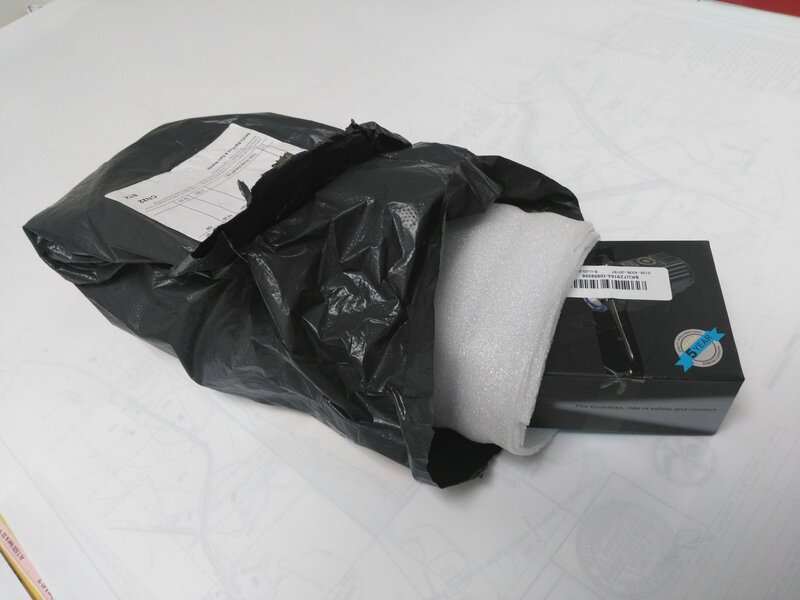 The package arrived in a stock Imalent box wrapped in foam and then inserted into a black plastic shipping bag. The packaging was sufficient. Inside the box was the light with a 26350 battery inserted, a magnetic USB charger cord, two spare o-rings, and instructions. First impressions were very good. Packaging was very professional, the USB charge cable feels and looks like a premium cable, and the light itself has a quality feel and appearance. 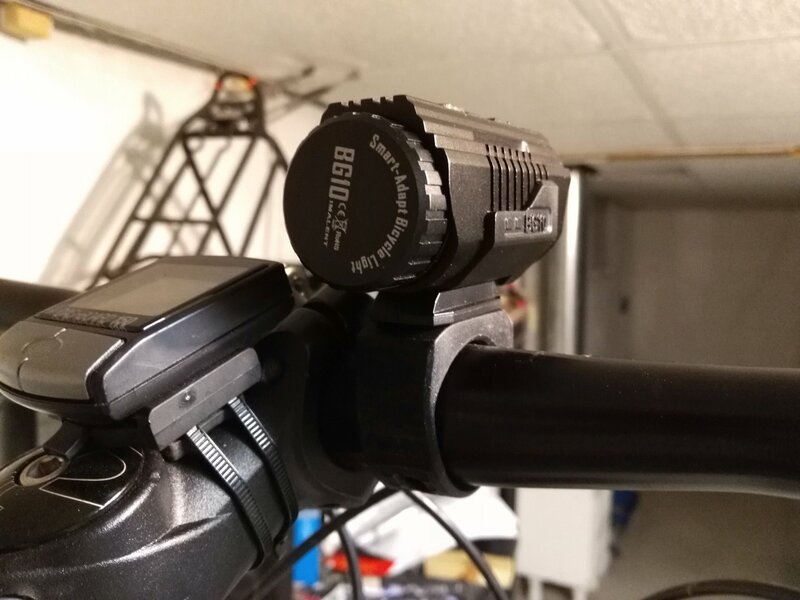 The handlebar mount uses a very nice strong silicone band. The only issue I saw was the way the light head attaches to the bar mount. It’s a plastic quick connect latch that does not inspire much confidence. I would say it’s suitable for a commuter light, but not at all suitable for any trail riding. 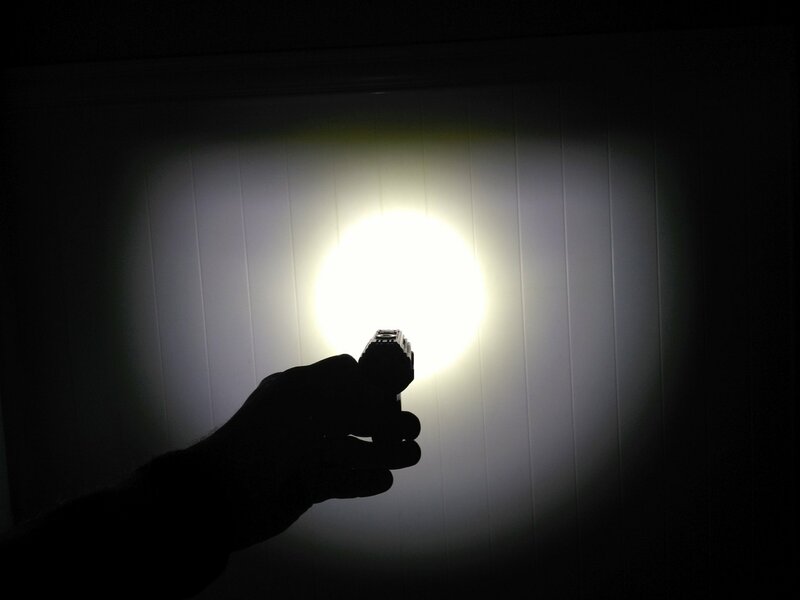 The BG10 uses a 2nd generation Cree XHP50 LED and an OP (orange peel) reflector. 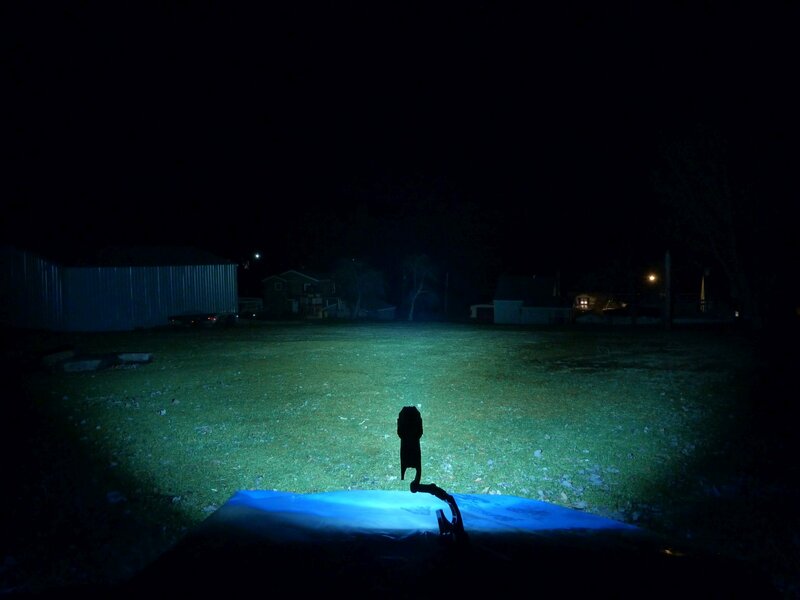 The light has a cut-off beam and also uses “Smart Adapt” technology to reduce brightness during on-coming traffic. The light has an OLED display showing battery status, output mode/level, and temperature warning. The included USB charging cable uses a magnetic connection to a charge connector on the top of the light body. I found this personally to be a little gimmicky and preferred to charge the battery in a separate external battery charger. The included 26350 Li-Ion battery claims to have 2,000mAh capacity (more on that later). 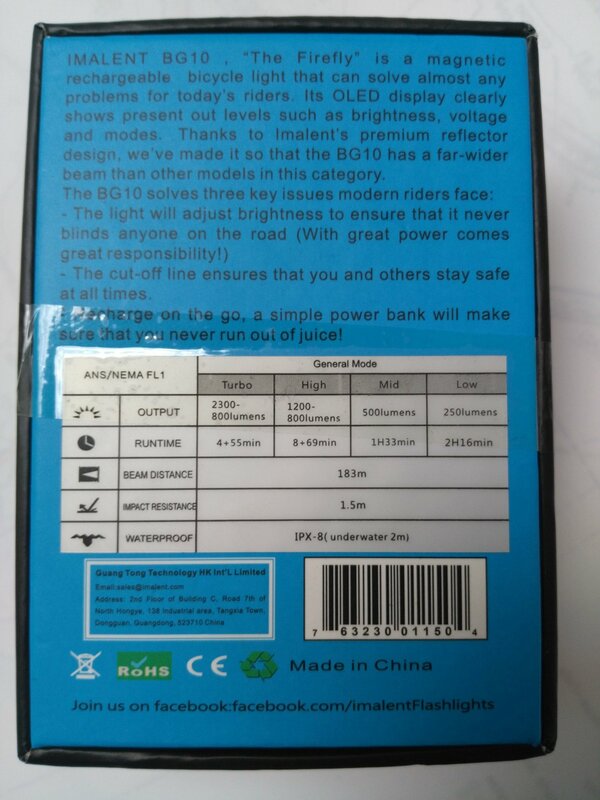 Even though the battery is listed as “built-in”, it’s a standard easily replaceable battery. It arrived at approximately 3.92v. One issue to note is that the battery is a bit of a tight fit (width) into the tube, so you have to try to squeeze it between your fingers and pull to get it out. I usually give it a shake to get it started. 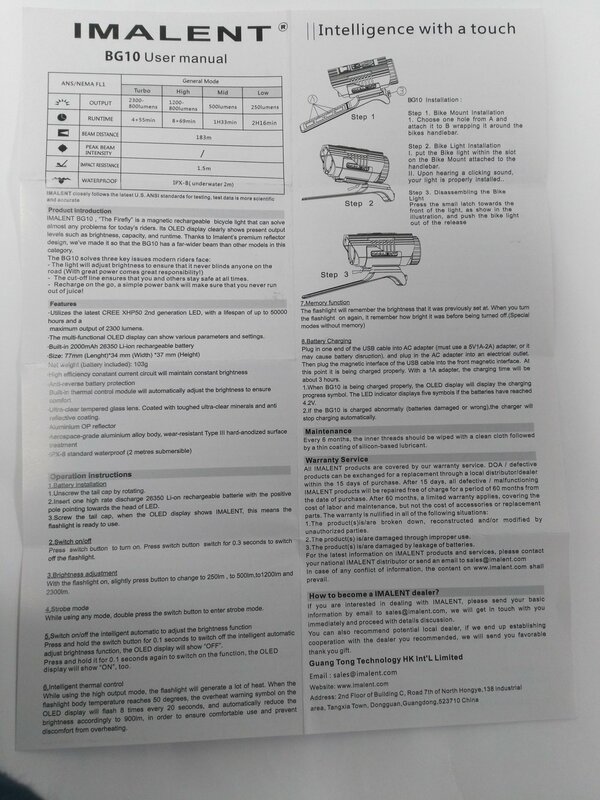 Notice in those pics how the mounting strap attaches at the front side of the light. 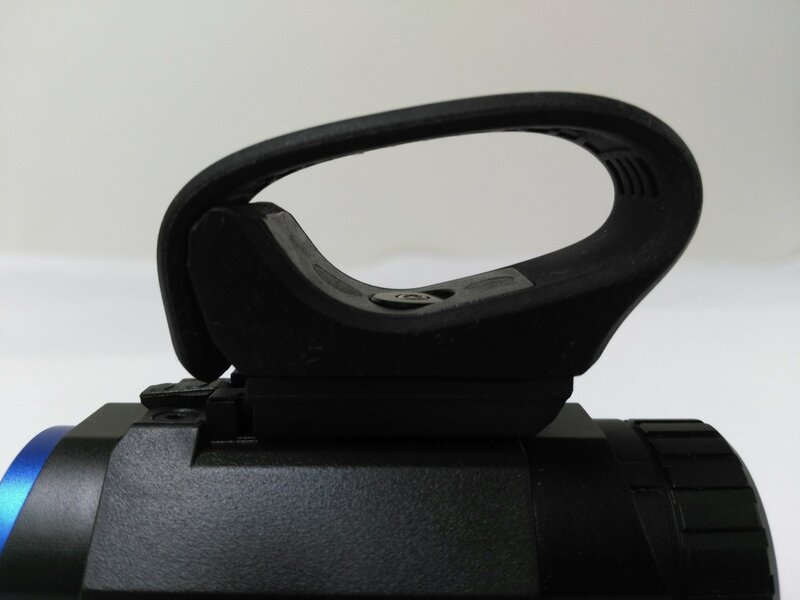 It’s a bit of a tight squeeze to put the strap into the catch with the quick-release lever of the light mount just above that catch (you could attach the mount and then slide the light into the mount). Another issue to note is that the mount will fit 35mm bars as well as 25.4mm road bars. Upon tightening the tailcap with the battery installed the OLED display shows “Imalent” for one second and goes away. Pressing the button a single press advances from “250LM” to “500LM” to “1200LM” to “2300LM” according to the OLED display. 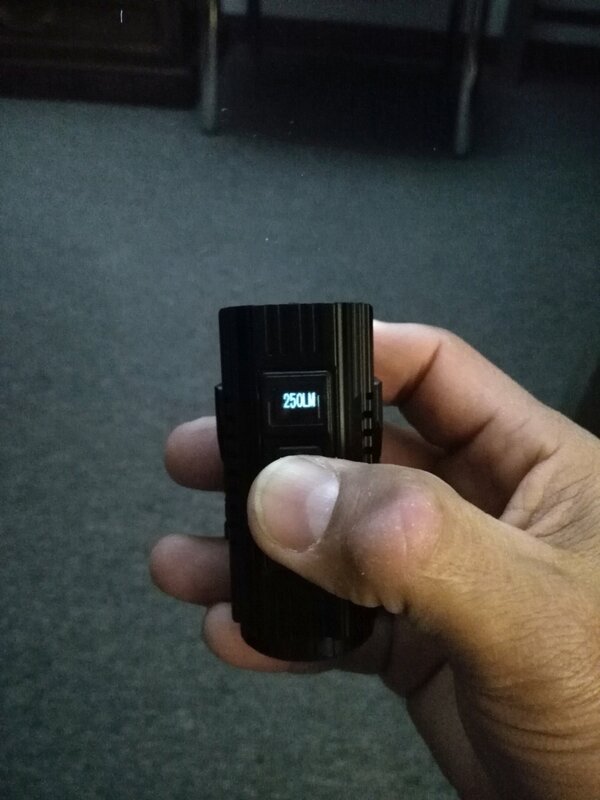 Once the battery is below a certain level the light won’t even enter the 2300LM mode; it just flashes a low battery symbol and drops back to the 250LM level. From either off or on a double-press will switch to a seizure inducing extremely fast & bright strobe (which by eye looks very close to the “500LM” output mode). A double-press from strobe mode does nothing, while a single-press returns it to the state it was in prior to entering strobe (off or on in which ever mode level). A triple-press of the switch from either off or on will cause the display to show the current battery voltage. One issue to note on using/testing the light, when used in either the “1200LM” or “2300LM” mode it would occasionally suddenly shut off on me. 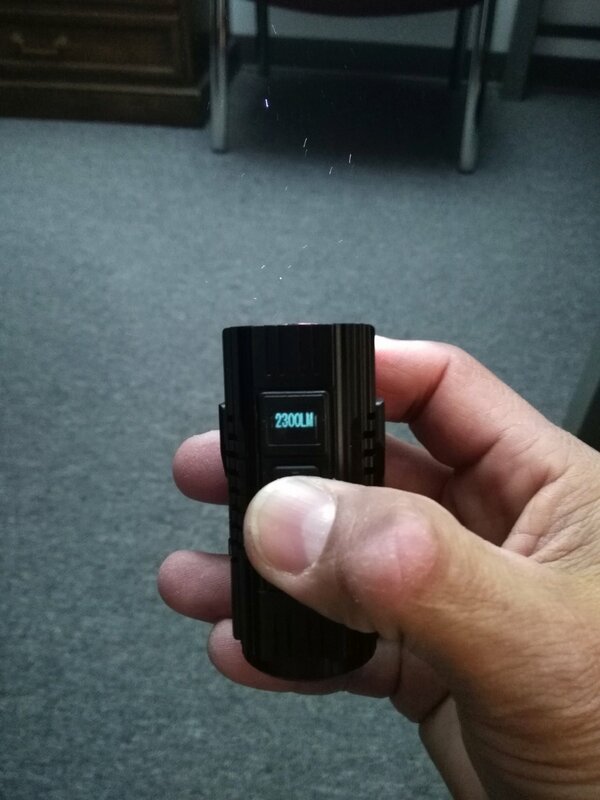 This can be seen in the video: “Imalent BG10 Thermal Test without Fan Take2” where after just 1 minute on “2300LM” it just shut off – no stepdown, no warning. In the video you’ll see that I turn it back on and it remains on and eventually goes into it’s normal stepdown. No idea why this happens, but it’s not good. Another issue to bring up is that the actual button under the silicone button cover is quite low which would be very difficult to activate with gloves on. On a positive note, the switch does have a nice solid positive actuation. “Smart Adapt”: From off or on, a press-and-hold for 1-second turns Smart Adapt “Off” or “On”, however when doing it from on (i.e. 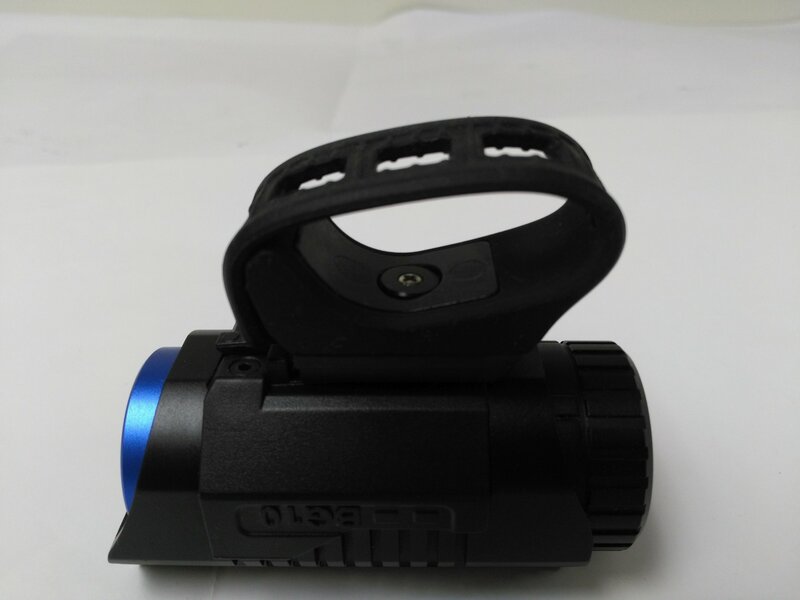 the light on in a steady output mode) the light will turn off and remain off. The light defaults to Smart Adapt being on which constantly through me for a loop when trying to advance through the modes during testing (the light output would remain the same while the OLED would show advance in modes because the light’s sensor was either sensing room lighting or the bounce-back from itself). 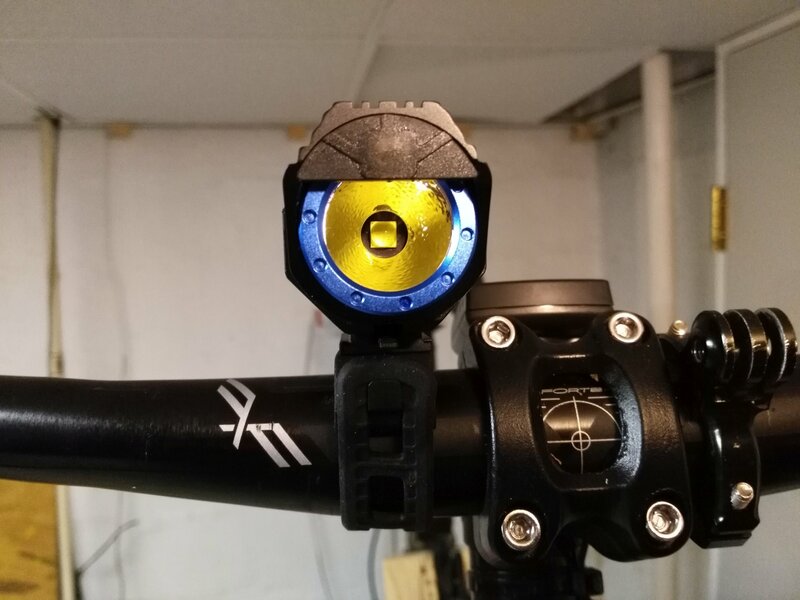 Smart adapt might prove useful for a commuter, but for a trail rider it’s annoying requiring to constantly remember to turn it off (it only resets to “on” when you unscrew the tailcap or inadvertently press and hold the button to change it). The tint of the light is a very nice cool white which doesn’t seem too far removed from a neutral white. My guess is that it’s in the 5,500k to 6,000k range. There is some slight yellowish-green hue around the hotspot, but it’s not really noticeable away from white walls. I checked the current draw while charging both with a meter at the tailcap (difficult to do) and using a “USB Doctor” measuring device. At the tailcap I was seeing only 0.3A at 3.94v, but at the USB Doctor (with tailcap reattached) I was seeing 0.62A which I believe to be more realistic. While charging, the OLED display shows a battery symbol with 0 through 5 bars. When it reached full charge it simply showed 5 bars, there was no other indication that charge was complete. The charging had stopped with the battery at 4.16v and even after leaving it connected to the USB charger for hours more it was still at 4.16v which tells me the charger actually terminates completely. 4.16v is a good safe level of charge, however it would have been nice to see that a little higher. The light definitely gets hot, so the thermal path seems sufficient. I tried to access the innards of the light, but could not get in without breaking the front light sensor cut-off bracket off, so I left it alone. I think the light actually does have thermal monitoring, but it’s hard to tell if a thermal stepdown is occurring or if the stepdown is simply due to low battery level. It is definitely not a simple timer stepdown though. 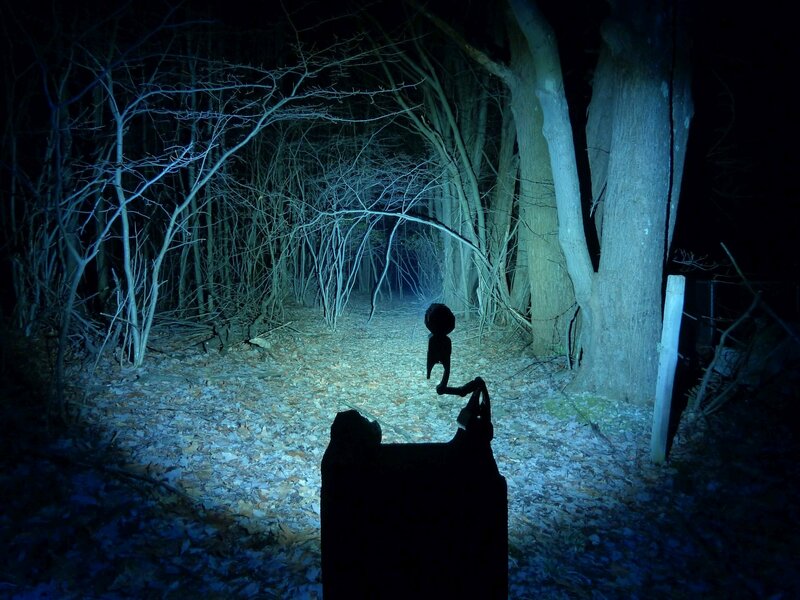 As you can see, the light falls well short of it’s claim of “2300LM”. It’s already pulling 6.7A to hit 1600 lumens, so I can’t imagine it pulling much more and yet yielding more than a few seconds of runtime! And 1600 lumens is not bad at all! In real world use the mode levels look pretty well spaced, although the Low mode could have been a little lower (like the “250LM” they call it instead of 350). One thing you’ll notice in a couple of my videos is that the lights output is quite steady right up until shutdown even in the “2300LM” setting. I’m sure it’s a current regulated driver. One problem though is that the light will just suddenly cut off without warning (other than the flashing low battery symbol which you may easily miss). It would have been much better to have the light itself flash or stepdown to a lower mode. 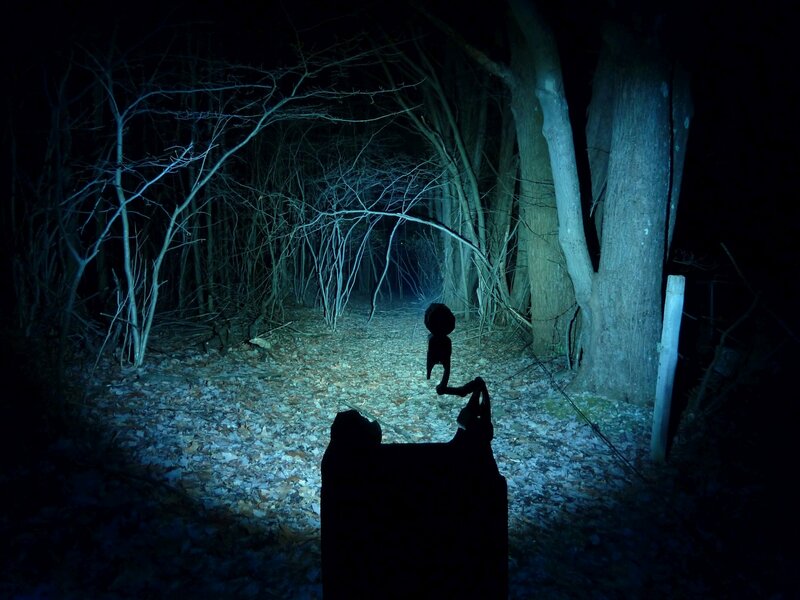 With it operating like this I would never recommend it for trail use, at least not without a 2nd light running at the same time so as not to leave you in complete darkness. I ran a few runtime tests. Medium (“500LM”) according to the manual is the highest level that remains constant without a stepdown. In this mode, with a fan providing cooling, I tested 1hr 17mins; not bad compared to it’s rated 1hr 33mins. I then ran a test on High (“1200LM”) with a fan cooling it and even though the manual says it should stepdown after 8 minutes, it never stepped down, the case temp. never rose above 94 degrees F, and it ran for 32 minutes. In the video you will see that it runs with a pretty constant output just slowly dropping down (luxmeter started at 2300 and only dropped as far as 1870 which computes to roughly 960 lumens dropping to 780 lumens). Testing in Turbo mode with a fan cooling it I got 4 minutes of runtime before it stepped down to 660 lumens at a case temperature of 101 degrees F. In my first runtime test on Turbo (didn’t start with a completely full battery) the light stepped down after 2 minutes 45 seconds with an outer case temperature of 118 degrees F. I let the light continue running and it never stepped back up on its own. 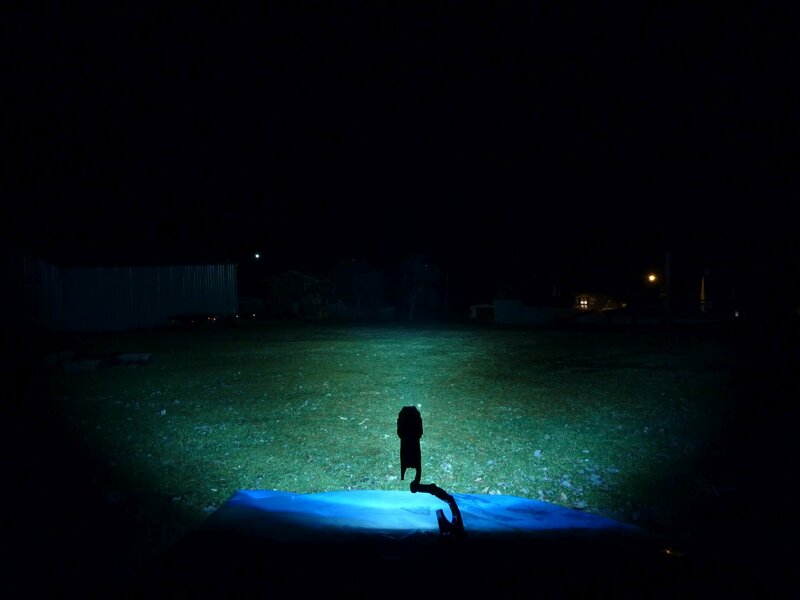 During other test I would bump the light back up to “2300LM”, but it would only run for about 30 seconds or so and then stepdown again. The case temp would remain pretty high around 116 degrees F during the stepdown level. That stepdown level appeared to be the 660 lumen level (I didn’t have it in the sphere). Based on stepdown level measurements I did see in the sphere I’ve determined it to be in the range of 630 to 660 lumens (probably varying due to battery level). It is difficult to determine when the light is stepping down due to heat and when it its stepping down due to battery level (perhaps it’s always due to heat). I ran a 2.0A discharge test on the included Imalent 26350 cell (which is rated at 2,000mAh). This test ran 1 hour 1 minute and yielded 2,034mAh. 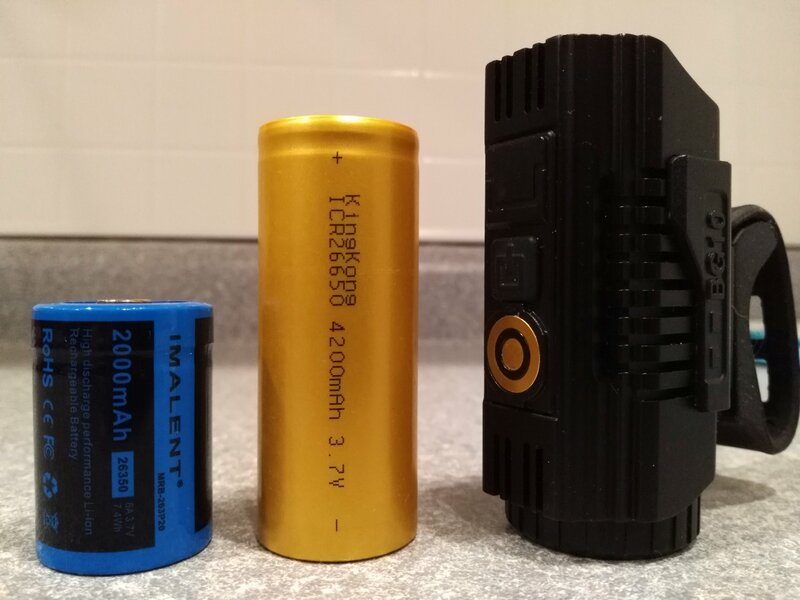 So the battery is definitely realistically rated and the fact that it yields capacity over spec at a 2A draw is noteworthy. While not a very common size, additional 26350 batteries can be purchased to be swapped out during rides. 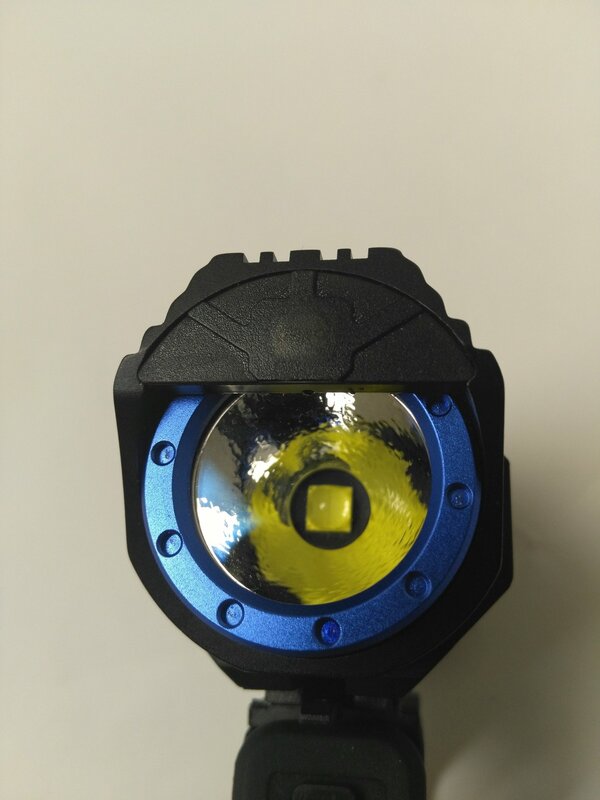 By appearance it looks like the BG10 has mechanical polarity protection in place relying on a button top to make the positive contact. This is untested though as I have no other 26350 cells to test with and hate to burn up the light trying this included cell backwards in it. Hope you enjoyed the review. More photos can be found in my Imalent BG10 Flickr album here. 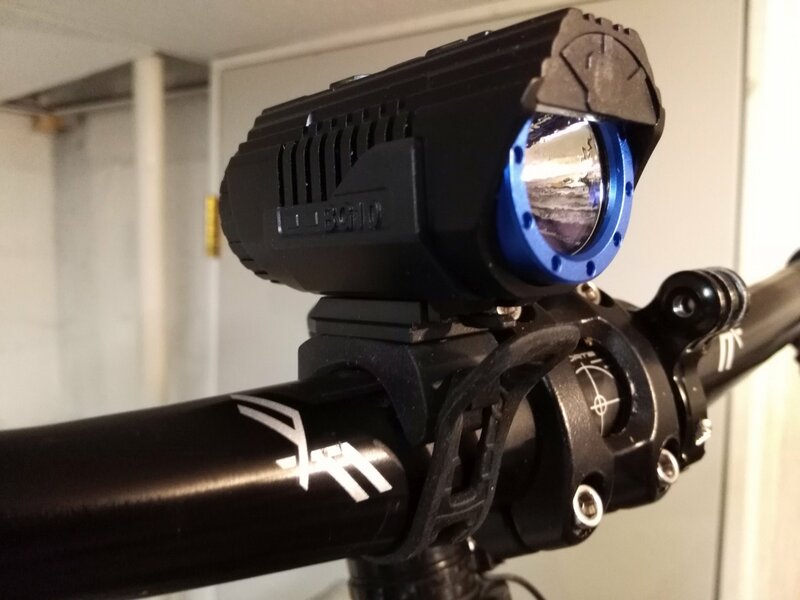 For reference, this review is also posted at MTBR at: http://forums.mtbr.com/lights-night-riding/imalent-bg10-xhp50-bike-light-review-1075245.html#post13626143 . Thanks for the comprehensive review gb. Wow, what a detailed review! Good job. Great review. It shows that you actually use the light as intended.